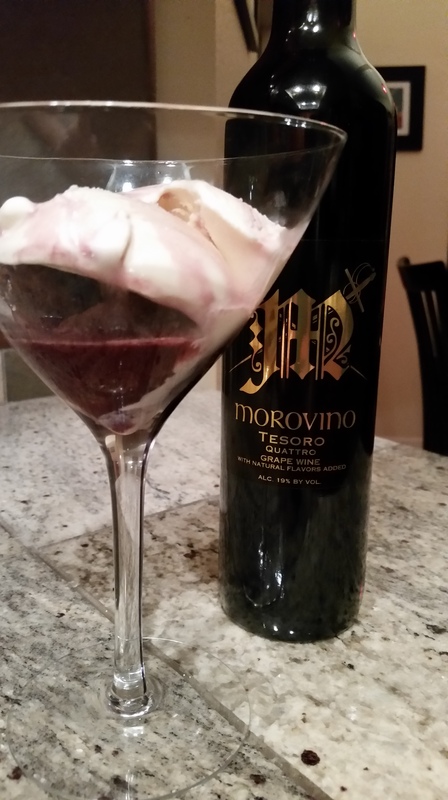 Even though the weather is warming up, I still love me some Tesoro chocolate, raspberry dessert wine. But it can be a little challenging to sip on it straight – when it’s 100 degrees with 89% humidity outside. Enter the Purple Pirate! This is not really a recipe – more like assembly instructions! Start with a large wine goblet. Add 2 T (or more if you like) of Tesoro. Fill the wine goblet 2/3 of the way full with cream soda. If you like foamy beverages, pour the cream soda directly on top of the ice cream for a large glass of purple chocolate raspberry ice cream foam. If you prefer your “floats” with more liquid, pour against the side of the glass to keep foam to a minimum. How simple is that. Try it, it’s my favorite thing – flashy and delicious! So so easy and absolutely delicious! Put the blueberries in the bottom of a pitcher and muddle them (crush them up a bit with a long spoon). Add the strawberries and the agave syrup. Dump the bottles of Pinot Grigio on top and give a stir to dissolve the agave. Refrigerate at least two hours – but best overnight. Serve the sangria in nice wine glasses, and add a few of the boozy strawberries! Some of you know that my go-to food style is Asian influenced. I love Asian-style cuisine because it’s quick, easy, fresh and pretty healthy. My love of Asian cooking started when I used to get to pick out a restaurant for my birthday dinner – you can read the blog post about that here. And Miso soup is my absolute favorite cold weather comfort food. So I stopped by our local grocery and saw a Miso I wasn’t familiar with (most stores carry Red, Yellow and/or White Miso). The Miso was called Mugi and it is made with aged, fermented barley in addition to soybeans. Well you know Mrs. Vino loves her a new food toy – so I had to take it home and check it out. So I made my basic Miso Soup recipe to check it out. Mugi is much milder and less salty than Red/White/Yellow Miso. It’s got a really interesting barley-y, malty aroma and slightly sweet flavor. It’s really delicious and I recommend it for a basic miso soup. But it reminded me very much of Guiness Stout (which I love with Salmon) and got the wheels turning for a new recipe. So here it is: Glazed Salmon in Miso-Stout broth. Mr. Vino loves it. I love it. AND, it’s a great way to use up any Stout beer left over from St. Patrick’s Day!! In a large saucepan over medium low heat, add the chicken broth, shitake mushroom stem, ginger, garlic, red pepper flake, rice wine vinegar and stout. Let simmer for 30 minutes. Preheat the oven to 400 degrees. Line a rimmed baking sheet with parchment paper and place the salmon. Spread the garlic hoisin sauce atop the salmon. Fill a second pot with water and bring to a boil. Using a slotted spoon, take all the funky, chunky bits out of the broth (garlic, ginger, mushroom). Reduce heat to low. Add in the miso, carrot, mushroom, celery and edamame and let simmer for an additional 10 minutes. While the broth is simmering, add the soba noodles to the boiling water and cook according to package instructions. AND put the salmon in the oven to roast. When soba is ready, drain well and put a little nest of noodles in the bottom of a pretty bowl. Ladle the broth over the noodles. Cut the salmon into 4 pieces and place a piece atop each nest of noodles. Garnish with sliced scallions. Serve with a green salad or quick-pickled cucumbers. If you eliminate the Stout and use Yellow or White Miso, this is my standard Miso Soup recipe. You can add tofu and/or whatever fresh veggies you have in the fridge and it’s really delicious. Making your own whole grain mustard is easy! OH YEAH, if you still have Stout beer left over, use it to make your own whole grain mustard – see the recipe/blog post for it here. This January, Vino Man and I decided to move to a more plant based diet. Better for us. Better for the environment. Tasty-licious. This move was made easier when we signed up for the amazing Talley Farms Fresh Harvest Program and started picking up a box of amazing, seasonal, locally-sourced produce every week. (Info on Talley Farms Fresh Harvest, here.) That, too was good for our bodies. And good for our pocket book – the Jr. share is less than $20/week (I was already spending that much on veggies at the grocer). In honor of our Tenth Wineversary, we decided that our monthly newsletters would feature some of our great wines in the past. So we dipped into the cellar and pulled out a Double Gold Medal Award Winning 2009 Dolcetto. We hadn’t sampled it in a while, and thought it would be a great opportunity to see how it was aging. But in our new more veggie-based world, we wanted to try the Dolcetto with a Vegetarian meal. Big wines and plant based meals pose some challenges, but I’m always up for a food challenge. Having recently been introduced to an incredibly amazing product called Kimbo Veggie Smoked Duck (Tofu), I thought it would be a great experiment. Full disclosure. I usually hate tofu. It’s my “Bête Noire”. In my 40 years of cooking (and I grew up cooking Asian-style dishes) I have never been able to successfully execute tofu. Until now. The recipe below is VERY quick and easy. Came together in about 15 minutes (excluding preparation of the rice). The Veggie Smoked Duck is available at larger Asian-style markets. My friend Judy brings it up from SoCal for me by the box – cuz the Vino man loves this too. Enjoy! Oh yeah, the Dolcetto? Well Damn. That Dolcetto is good stuff. The 2009 is prime right now – even smoother than when you put it in your cellar. It was great with this dish and will still absolutely hold up to lamb, steak and meatier dishes too. We recommend that this wine be consumed this year – before the fruit begins to fade out. Prepare your rice via your preferred method. I like my rice cooker – perfect rice every time. When there’s about 10-15 minutes left on your rice, start your stir fry. Preheat your oven to 250 degress. In a large heavy bottomed skillet or wok, heat 1 T of Canola oil over medium high heat until it shimmers. Add the onions and saute until they are limp and lightly brown, about 3 minutes. Stir constantly, as you are using pretty high temperatures. You need to keep the food moving or it will scorch. Add broccoli florets and stems and saute another 3 minutes. Then add cabbage and Edamame and saute 2 minutes more. Add the garlic and half the Hoisin and all the Sake/wine. Stir for about 1 minute until the garlic is fragrant. Put the veggies in your serving dish and place in the oven to keep warm for a few minutes. Put the second tablespoon of oil in the saute pan and heat till shimmering. Lower heat to medium. Add the smoked duck and the second half of the Hoisin sauce and heat until just warmed through – 2-3 minutes. Pull out the veggies, top them with the smoked duck, then sprinkle with the green onions. Serve atop the rice with the Morovino Dolcetto vintage of your choice. Amazing. Introducing Morovino Small Batch” Wines! Small batch wines are hand crafted in quantities of 50-75 cases. you have asked why a “small batch” label when we are already a very small producer (2,000ish cases/year)? We are a small producer tasting and selling out of a destination beach town. Because our town is so exceptionally beautiful, we are lucky enough to get repeat visitors – people who come to see us every six months, or even once per year. We call these customers the Morovino “irregulars”. We’ve sensed some frustration with our irregulars that they visit and taste a wine, but when they come back 6 months or a year later, they can’t get the same great wine they loved on their last visit. Our core Italian varietals – Dolcetto, Barbera and Sangiovese – are typically produced in 200 – 300 case lots. While that’s small to most producers, we typically expect to sell out of a 300 case lot in a bit more than a year. The “small batch” label is to help identify wines that were produced in lots of 50 – 75 cases. These are wines that will move in and out of the tasting room quickly (probably a 3-4 month lifespan). The cool new label will help our customers know that if they LOVE a small batch wine, they might want to consider getting an extra bottle – it probably won’t be around the next time they visit. Plus, Mrs. Vino is just loving the burgundy background. Small Batch wines should be in the tasting room by the end of February. We hope you come and check them out!! A great way to celebrate the start of strawberry season! Add ½ cup of Cosa Dolce. Stir gently, then refrigerate for at least 2 hours. Cube 3 1-inch slices of Angel Food cake. In the bottom of a martini glass, put 5 cubes of Angel Food cake. Top with ½ c. to ¾ c. of the berry and orange mixture. Be sure to include some of the juice. Drizzle the top of each dessert with 1T of Cosa Dolce. THEN, go crazy! Drizzle the top of the strawberries with chocolate sauce or top with a big dollop of whipped cream. What the heck, do both! Prepare for the rave reviews. Serves 4. Gotta love a super easy, flashy party dessert. While Mrs. Vino loves to cook, she is not a baker! You see baking has rules, my dears, and I quite simply don’t like that. So it’s important to have a flashy, go-to party dessert that doesn’t necessarily involve baking! And here you go. Start with a martini glass – because everything is prettier in a martini glass. Put a brownie bite (I get mine from Costco) in the bottom of each martini glass. Put a scoop of Vanilla Bean ice cream on top of the brownie bite. Drizzle 2T of Tesoro (more, less, whatever you want) over the ice cream. The dessert wine will melt over the top of the ice cream, down through the brownie bite and end up pooled in the bottom of the martini glass like a crumbly, creamy shot. Top it with whipped cream, if you dare. Sometimes it’s hard for people to envision pairing a sweet wine with a savory dish! But this beautiful recipe has it ALL goin’ on – Sweet, tart, salty, spicy, and umami – it tickles all your taste buds. And the spicy black pepper is the perfect foil for the lightly sweet riesling. You are going to love it! Heat the oven to 400 degrees. In a large ovenproof baking dish, combine the sweet potatoes and the olive oil. Toss well to coat. In a small bowl, combine the brown sugar, salt and black pepper. sprinkle half of this mixture over the sweet potatoes and toss or stir to coat. Arrange the sweet potatoes in an even layer in the bottom of the baking dish. Rub the remaining sugar mixture over the chicken thighs with your hands (sure it’s a little messy – but so much fun). Arrange the chicken in a single layer over the sweet potatoes. (I don’t need to tell you to wash your hands thoroughly at this point, do I?) Drizzle the maple syrup over the thighs. Cover the baking dish with foil and roast for 30 minutes. Remove the foil and roast for another 15 minutes or until the chicken reaches 165 degrees at the thickest part of the thighs. Serve the chicken on top of the sweet potatoes – just before serving, sprinkle the lemon zest over the chicken. It’s great served with biscuits to sop up all the yummy maple juices. Yes, Mrs. Vino knows that braising takes a looooooonnnnngggggg time. But most of this is completely hands off. No really. Don’t lift the lid and peek. Keep your hands off! This recipe actually only has about 10 minutes of active cooking – and the way your house will smell is totally worth it. When the meat is completely browned, add the broth, Bay leaf, wine and sliced onion to the pan. Reduce heat to medium low, cover and let braise for 2 1/2 hours. Check the pan after a few minutes, you are looking for a simmer – not a boil). Once it is simmering, leave it alone. No peeking needed. After 2 1/2 hours, remove the lid, carefully take the meat out of the pan (it will be fall apart tender) and keep it warm, then adjust the sauce/gravy as needed. Depending on how lean your meat is, you might need to add extra wine or you might need to turn the heat up to a boil to thicken/reduce. When the sauce is to the consistency you like, remove the Bay leaf and add salt and pepper to taste. Serve the meat with roasted or mashed potato (polenta is also yummy) and cover everything with the sauce. Comfort food at its easiest/most affordable. You are currently browsing the archives for the Fun with Food and Wine category.